Our professional grade lecterns are perfect for your conference, business event, wedding or any situation where you need a podium for your notes, your laptop or simply an object to hide behind while giving your speech. 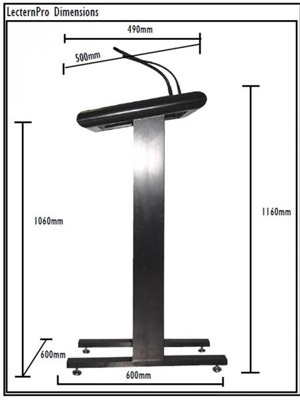 The lecterns come with a gooseneck microphone which you may connect into the house PA system or you can hire the speakers from us. There are two XLR sockets at the bottom for pro audio connection. You may either pick up from us or we offer delivery and pickup in the Sydney metropolitan area. Typical costs are $100 - $120 depending on your location. 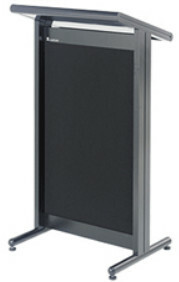 Many of our clients attach a banner on the front of the lectern with their logo. Below are the dimensions to make ordering the banners easier.